Inspired by early non-classical harpists such as Dorothy Ashby, Alice Coltrane and Andreas Vollenweider, Diane diverted her classical studies, to the world of Jazz and Composition. 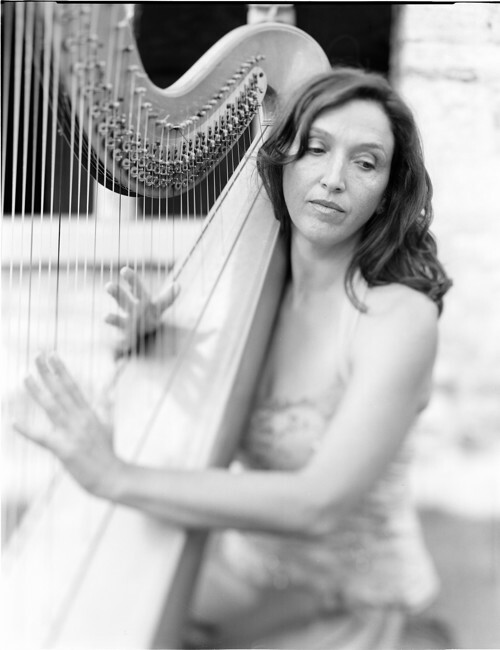 Harp lessons began at the age of 5 with Lydia Shaxson. She studied also theatre and film then was drawn to jazz and composition. She is the first harpist in Australia to complete the Victorian College of the Arts JAZZ and IMPROVISATION performance degree. She studied with Huw Jones and Marshall Mc Guire (harp), combined with lessons from Ben Robinson ( bass) and Tim Stevens ( piano) to name a few. Influenced by Australian musicians Mark Simmonds, Chris Abrahams (The Necks), Paul Grabowsky. She then took lessons in New York with Park Stickney, and was happy to also meet the mythical Daphney Hellman, and sad not to have ever met Alice Coltrane. Diane Has performed in NY, Paris, Netherlands, Italy and of course AUSTRALIA. Diane is constantly gaining skills and inspiration playing and recording with musicians in Italy where she lives now in Europe. Some international appointments include: being Invited from Australia to the 5th European Harp Symposium in Amsterdam with her 5 piece band 2001, and the ANU International Harp Event 2004 , where she played in trio and took a jazz / improv workshop. In Italy the International Harp Festival of Viggiano saw a concerto of cafeAmaro and improv workshop in 2015. Concerts between Australia Italy and Paris include OZ tour of “bass & harp on tour” 2015. Projects following her 1st band in Australia, Archaeopteryx, (a jazz line up of Bass, Drums, Sax, Trombone) with CD, and ADANA, include “Project Sunrise” in Australia double ensemble of jazz and strings .TRIO AMARONE : harp Diane Peters, Bass Nicola Monti, Viola Maria Vicentini, have played concerts of original jazz by Diane Peters in Italy and toured in Australia in 2009. "Salti Temporali" a concert recorded live in 2011 for a CD of all original music by Diane Peters. Diane collaborates with Shakespeare in Veneto from 2016 with live original music on stage in the theatre production of Romeo and Juliet, directed by Solimano Pontarollo. A CD of cafeAmaro out in 2017 Diane Peters + Apo(tech) Harp , voice and Electronica. In 2017 Diane Peters Live solo set , (an ongoing work in progress of jazz , and original music with electonic manipulation of the voice and harp), appeared at TolfArt festival in Carpineto Romano and the Padova Jazz Festival 2017, and in 2018 various concerts including Notte della Borgo in Salento 2018. The new project of 2018 is BLUE IMMERSION, with Marc Abrams on bass and Enzo Carpentieri on drums, with concerts in Padova, Venezia, Sirmione video BLUE IMMERSION "live in venice"
Diane Peters è un'artista di livello internazionale formatasi a Melbourne dove si è esibita in diversi formazioni non classica nei locali e jazz club. Si è laureata presso VCA e Monash Uni Melbourne, in jazz, improvvisazione e composizione. “Diane Peters’Archeaopteryx” un CD di sua musica originale in quintet era registrata per "A.B.C jazz track" a A.B.C. studios Melbourne. Ha suonato a New York, Parigi, Belgio ed Amsterdam per 5th European harp symposium. Festival internazionali di arpa: '98 Perugia, 2001 Arles, 2004 ANU Australia e 2015 Viggiano. In italia dal 2005 ha interpretato le sue musiche con diversi musicisti quali: Stefano Benini, Maria Vicentini, Yuri Goloubev, Danilo Gallo. Ha registrato per Nicola Conte Bari (Blue Note Jazz). Con il suo progetto "Harp n Bass" ha suonato con Antonella Mazza e Bruno Rousselet a Parigi e in Australia con Nick Haywood e Lyndon Gray 2015. Cd del progetto cafeAmaro ( arpa ed elettronica con Andrea Ponzoni ) è uscita 2017, con i LIVE in Italia Roma, Firenze, Milano. Il Progetto BLUE IMMERSION ( in trio con Marc Abrams - bass e Enzo Carpentieri - drums è la novità del 2018. “Salti Temporali” in Italy with Accoustic string trio and recorded sounds, having produced a CD of the live performace tube. cafeAmaro = Diane Peters + (Apo-tech) co written electronic pop/ jazz, soundscapes, tracks beats and improvisation. member of MOSAIKA , a Verona based ethno/ jazz orchestra. CD release of cafeAmaro in 2017 recieved web media and reviews. www.cafeamaro.com. 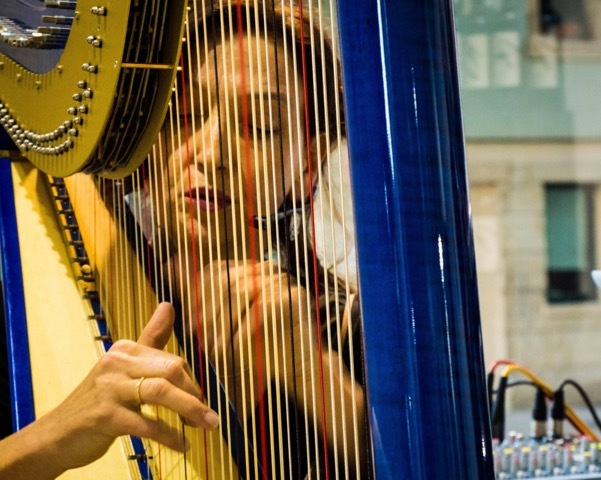 "The Harp, a rare and evocative instrument, played with the virtuosity of Diane Peters, meets with the electronica of Andrea Ponzoni."